I’ve recently had the opportunity to become a Sewing Portfolios Ambassador! What is Sewing Portfolios you ask? It’s an online sewing community that brings together individual seamstresses and businesses/brands to collaborate together! As a member, you create your own ‘portfolio’ to showcase all of your work, and businesses can access your portfolios to see if you might be a good team. It’s also just a great spot to keep all of your work together in one accessible place. It’s completely free for both individuals and businesses to join. To learn more click here. As an ambassador, I had the chance to sew up this great fabric, In Bloom by Sandra Clemens for Michael Miller Fabrics. It’s a lovely 100% cotton woven fabric collection in vibrant spring colors of burgundy, blush, orange, teal, and grass. It is very rare that I have the opportunity to sew with premium designer fabric such as this, so sewing these garments was a little slice of heaven. I received one yard each of Flower Yard, Summer Fern, and Linger. I knew I wanted to use every last inch of this gorgeous yardage so I started planning. First, I made the Wanderer Tunic from Striped Swallow Designs. I love that I was able to incorporate three coordinating fabrics in this one great pattern. The V-shaped bodice and double-banded sleeve detail set this pattern apart. It features a keyhole button closure in the back and has long, 3/4, and short sleeve options. It’s available in sizes 2T – 14 years. Next I chose the Lune Top and Dress from Lil Luxe Collection. 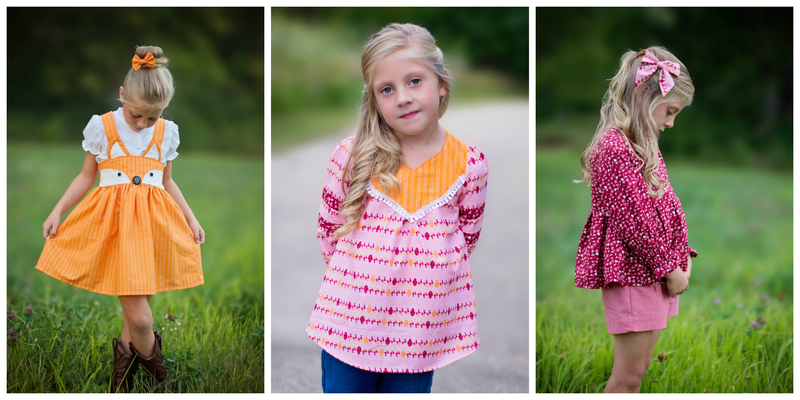 It is available in size 18 month – 10 and features top or dress length, long or short sleeves, and my favorite, pleated or shirred options for the long sleeve. Isn’t this shirred sleeve just delightful? I am smitten! Last, I knew as soon as I laid eyes on this gorgeous orange fabric that it had to become an Animazing Suspender Skirt from Little Lizard King. Perfection? I think so! And of course, no outfit would be complete without a matching hairbow! I used The Dutchess and the Hare’s (free!) 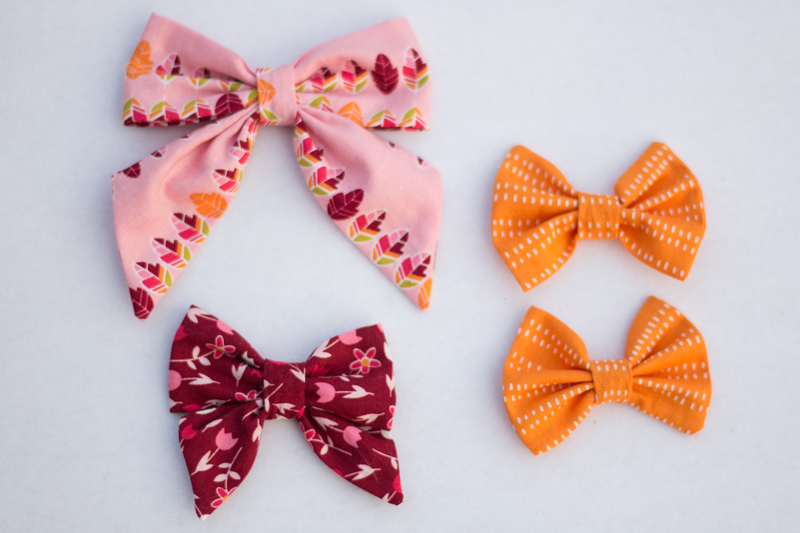 fabric hairbow pattern to make these cute little accessories. I’d like to thank Michael Miller Fabrics and Sewing Portfolios for the opportunity to sew up these gorgeous fabrics.